Discussion in 'General Attire & Accoutrements' started by univibe88, Oct 21, 2010. Many of you may not know about Gfeller Casemakers. I first found out about them on a fountainpen forum when I was looking for a cover for my Moleskine notebook. I have gone on to also buy a very nice leather belt. I have been dreaming about a briefcase and finally pulled the trigger. This quote from their website sums it up best Originally focusing on the needs of geologists, engineers and field scientists, we developed leather goods that carried tools, protected notes and maps and generally made field work easier and more productive for these adventurous professionals. 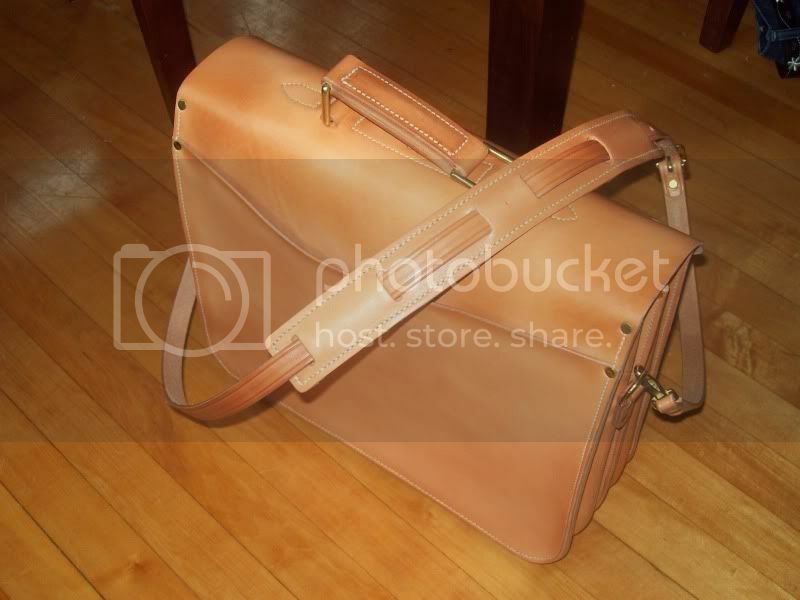 It took about 8 weeks from the time I contacted Steve until I received my briefcase. He is very open to customization and will make you anything you want within his abilities. All of Gfellers products are made with heavy sinlge ply leather finished only with neatsfoot oil. The products start a very natural tan color and quickly take on personality. My notebook cover and belt are completely different than the brandnew briefcase. 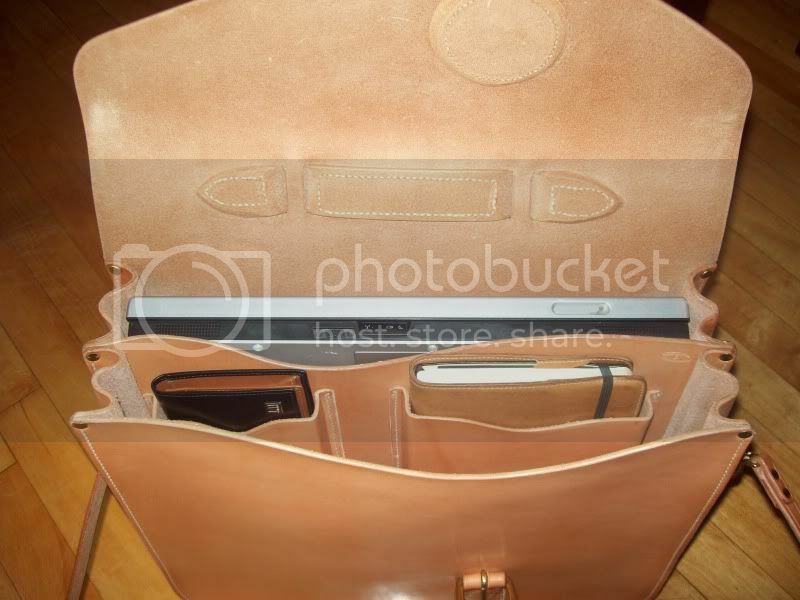 You can see that in the picture of my notebook on top of the briefcase. 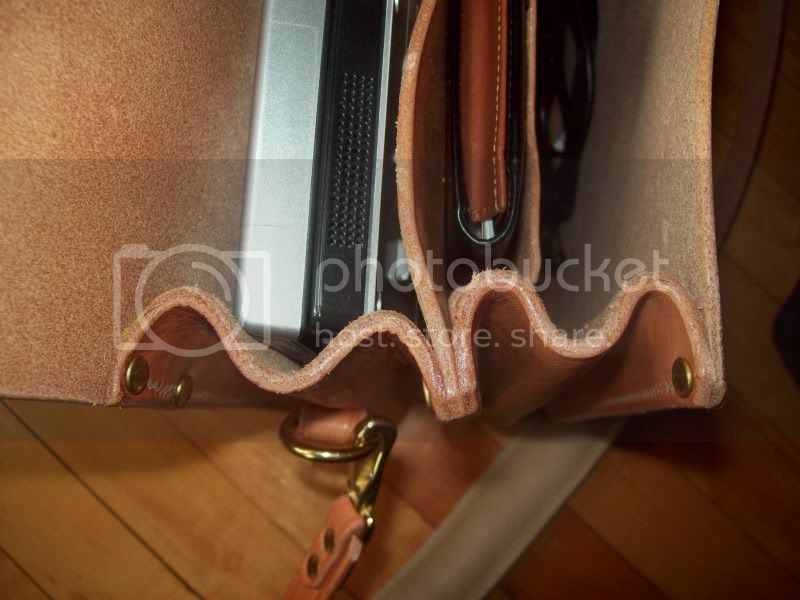 The base briefcase is two compartments with a buckle front and padded strap. I had steve add the rear pocket you see below, as well as the internal pockets for my checkbook and Moleskine. I felt like this is a very high quality product that fits the mold of what many of us like here at the lounge, so I wanted to share it with you. That is a great looking case, congrats! Absolutely beautiful, that bag is. I'm a fan of Gfeller, too! 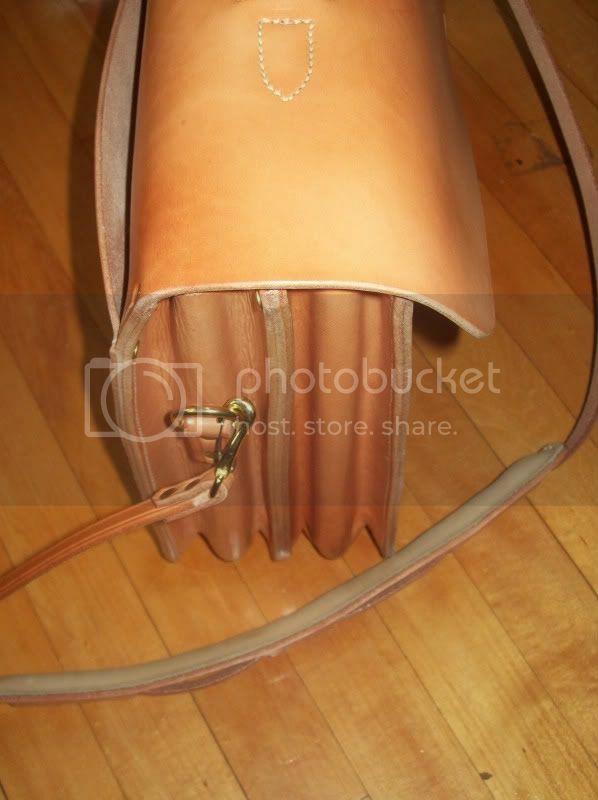 Yeah, wait'll that veg-tanned tool leather starts to deepen and 'orange' up a bit. Niiiiice. Thanks guys. I'm really happy with it. 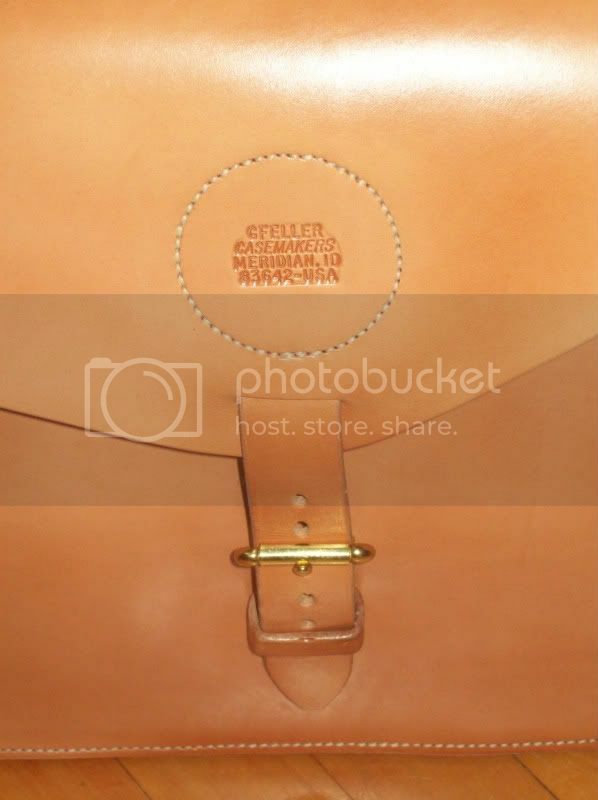 Steve, from Gfeller, gave me this additional info about the leather: it is made using vegetable tanned Skirting Leather from the Hermann Oak Tannery in St. Louis. We are proud to have maintained an account with them for well over 50 years. In our industry, Hermann Oak is the standard to which others aspire….it really is the best leather for our purpose tanned in the USA today. The reddish –orange color results from the particular tree bark used in their tanning process. He told me the notebook cover is from a different tannery. So the picture above is not a good indicator of how the case will age. However my belt is made from the exact same leather. I'll grab a picture of it soon. Gfeller's customer service is outrageous! My only quibble is with the latch that attaches the strap to the d-links. I didn't find them sturdy enough. 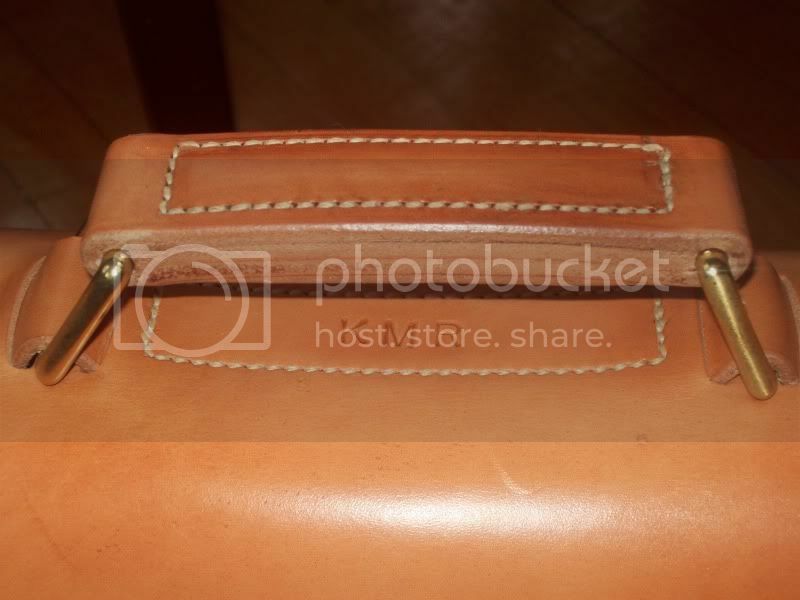 I contacted Steve and he is happily and immediately making me a new strap with sturdier conway buckles. I've lived in St Louis since 1985 and had never heard of the Hermann Oak Tannery...looks like they are in an industrial area near a Procter and Gamble soap factory north of downtown. I never cease to be amazed at local businesses I was not aware of. I like the case. Will they make it sans stamp? I don't know. I didn't ask. But I have a feeling that gfeller would do nearly anything you ask them to do. mind if i ask how much this case ran you? The base price is $450. That is for a 2 compartment case. 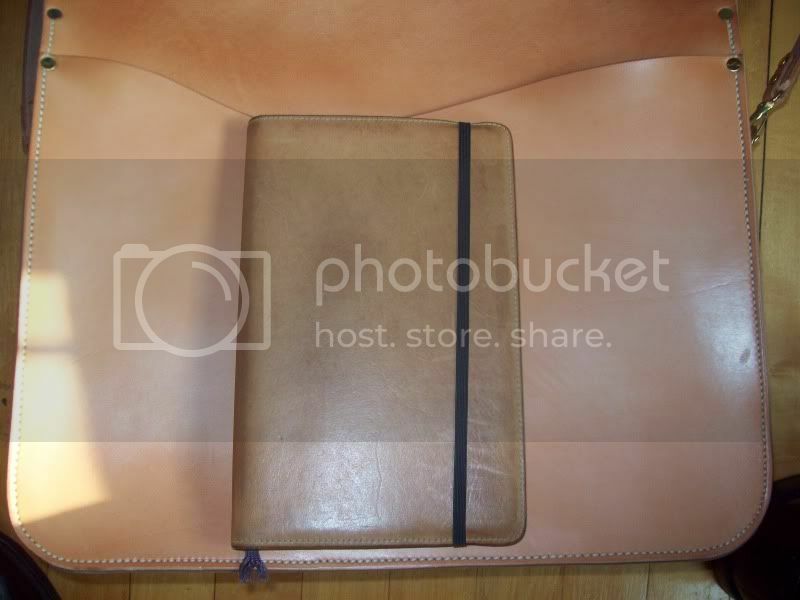 I added the external pocket and the custom sized internal pockets for my notebook and checkbook. That brought the total to $550. Very nice, seems like a great deal for that kind of quality. 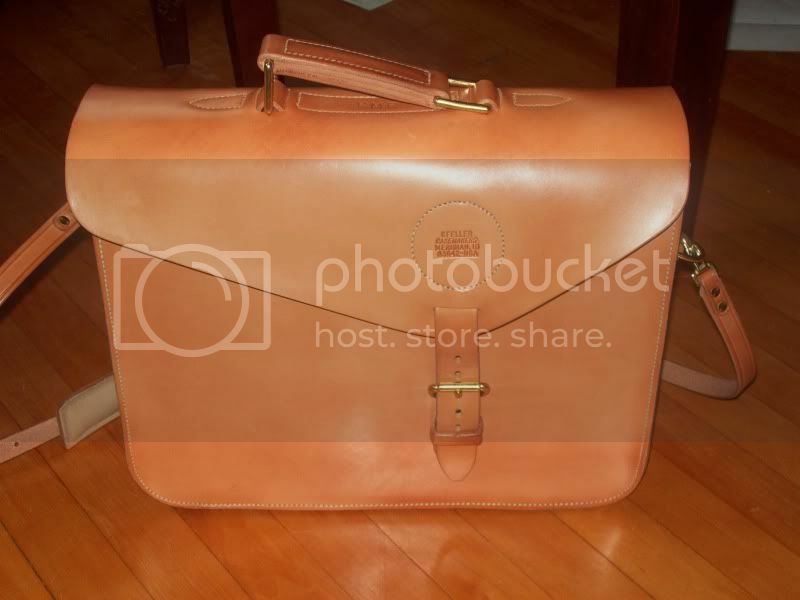 That's one stylish briefcase. Another case of getting what you pay for.